“Katy Perry?” I joked quizzically to Pemba, the young Nepali girl walking with me. We were attempting to name the stray dog loping along side us on the dirt pathway to Namche, still several hours away by foot. The faintest flicker of a smile creased across Pemba’s mouth before returning to the usual stony faced, shy countenance I had grown accustomed to addressing. “No, Nepali dog, Nepali name…kaulo (black dog),” she pragmatically countered with resolve that surprised (and delighted) me. She proceeded to lean over and pet the newly anointed stray. “A journey of a thousand steps begins with one”, I thought, pleased at myself for applying an analogy both situationally appropriate and in reference to what I hoped was a growing bond with Pemba. Hopefully the remaining steps leading to Namche would maintain the momentum. That day was a long walk from Monjo to Namche, the last major outpost and junction for hardy souls trekking to Everest Base Camp. Namche is where all paths converge, so it’s a bigger town, with lots of lodging, supplies, and bakeries. It’s also home to the Namche Bazaar which serves as a central market for locals from all regions to sell and acquire their daily necessities. The walk was about 4-5 hours, including a 800 meter ascent and some winding switchbacks throughout. I headed out with the early group, prepared for a grueling and tiring day (and the hike did not disappoint). We were led by Kami, a super energetic, fun Sherpa volunteer with ever present smile on her face, and a contagious giggle always at the ready. As our volunteer group fastened our belts and tightened the straps, one of the ENG girls, Pemba, joined our expedition, to accompany us to Namche. Her family had recently relocated and her secondary school was near Namche. The realization hit me at that moment. Pemba, on her winter holidays, walked four hours yesterday to Monjo, arrived at the classroom ceremony, performed a beautiful solo dance (Pemba had been selected due to her talent to travel, dance, and compete overseas) and now was about to embark on a four hour return journey. If I had ever wondered whether the ENG girls understood or appreciated the value of the education and the scholarship, the answer was never more clear. We’ve all been regaled with stories (or known people who have been) of grandparents or great uncles who would trudge miles in snow and sleet to get to their first job/class/etc. Here was a young girl, standing before us, who by days end, would have walked 8 hours on challenging mountainous terrain in chilly winter weather just to show to a majority of foreign visitors she had never met, her appreciation and commitment for her opportunity to learn. She didn’t even go to this school in Monjo but wanted to be part of the ceremony since we would not have the opportunity to visit her school. Unbelievable! I had originally met Pemba last year. She was one of the older girls, particularly shy around guys, and I struggled to make conversation with her then. It’s easier to see and hear from the girls who were more effusive and talkative, about how much they appreciate the opportunity to learn. However, with Pemba’s actions I knew that our efforts here in Everest with girls like her, were meaningful and she was committed to making the most of her educational opportunity. 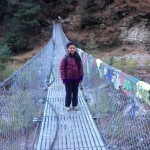 Inspired and humbled by Pemba’s dedication I set off to Namche with her and our group. I’d love to say those next four hours of trekking were filled with joyful dialogue, profound soulful discourse and earth shattering revelations on her future plans. Alas, it was more a four hour monologue by me doing my best to draw her out of her shell. With the now-named Kaulo weaving between our strides, we did manage to find some common ground by the time we reached her house, including American music (yes, Katy Perry, if you must know), Nepali phrases, and the art of stair climbing. For me, I’m chalking up a victory with the few half-smiles she couldn’t suppress I caught wind of, and a warm, sincere hug I got from Pemba at the end of the walk, when we met her couldn’t-be-more-expressive-mother (and equally taciturn brother). And of course the realization of the appreciation and dedication girls like Pemba have to learning and schooling, and our obligation to make scholarships possible to her and her peers for many more years to come. Next time, when I’m sure I will see Pemba still diligently studying and committed to making the most of her education, I’m hoping to earn at least a dozen smiles and maybe even a chuckle or two. One can hope….